I don’t normally buy a lot of fake meats but when I do, I fry them in oil and cover them in hot sauce. I was at my local downtown urban market, Duckweed Urban Market, which is like, my new favorite place in the entire world. I go there most days during the week on my lunch break. I saw a box of “vegan cutlets” and decided to buy them. They taste pretty good, good texture and are easy to prepare, especially if you have guys (or girls) in your life who want, beefy, manly and meaty food in their diet, but stay true to the veggie diet. This isn’t much of a recipe, but here is how I went about preparing the Elianni Vegan Cutlets. I rehydrated them in vegetable broth as per the box, but I seasoned it with some garlic and onion powders, poultry seasoning and a decent sprinkling of smoked paprika. Once they were rehydrated (takes about 5 minutes for them to soak up enough liquid to be “meaty” again). 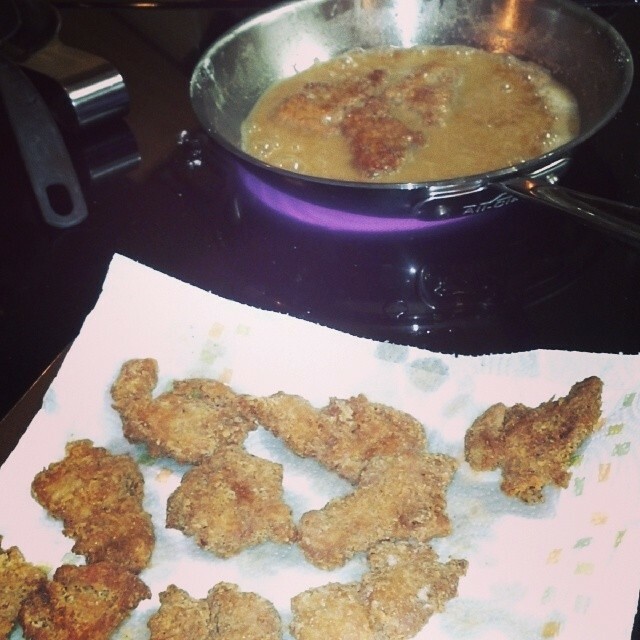 I heated oil in a skillet, tossed them in flour and fried until golden brown. I let them drain on a paper towel lined plate then tossed them in Franks Red Hot, smacked them on a wheat bun with some nutritionallly void (lol) iceberg lettuce and called it dinner. Perfect fast meal, one of my hubby’s new favorite “bar foods,” as we call it.